Obama’s $800 billion stimulus bill has both policy makers and the public wondering what the bill will actually manage to stimulate. Yet, somewhat surprisingly, a recent study shows that left to fend for itself, the United States is inherently prosperous. The Legatum Prosperity Index recently released a study of the most prosperous nations, measuring economic growth and quality of life. The study found that the U.S. – despite its current economic situation – ranks fourth out of 104 nations. The amount of wealth and sense of well-being enjoyed by U.S. citizens is higher than any among large countries, with no other country with more than 100 million inhabitants ranking above the top 10. When looking at prosperity in this fashion, America and its ability to foster both economic and non-economic progress is what puts it so high on the scale. The US still rewards innovation and entrepreneurship to an extent seen in few other countries. This opportunistic culture provides the basis for successful growth of commerce even in an otherwise weak environment. On the flip side, the US ranks just 7th in economic competitiveness and below average on promoting international trade and investment. The stimulus bill could offer some jolt to the weak economy, but given access to capital, Americans might prove adept in finding their own path to prosperity. President Obama’s recent executive compensation plan comes on the heels of the revelation that Wall Street firms awarded over $18 billion in bonuses last year. The plan will create a $500,000 pay cap for executives at companies receiving substantial taxpayer bailout money. But in the longer run, is this all bad? The so-called “brain drain” of high priced talent – the same folks who got us in trouble in the first place – could be fortuitous if more creative and innovative professionals now arrive on Wall Street. A new breed of Wall Streeter might have the potential to create a sustainable industry rather than the current casino culture. What may be a superficial wound on NYC in the short term may benefit the country as a whole – and even New York – in long run. A recent survey by Pew Research finds that nearly half of Americans (46%) "would rather live in a different type of community from the one they're living in now," with those living in cities expressing the highest desire to live elsewhere. Even though many Americans say they are interested in giving somewhere new a try, most of us seem to think that our current communities aren't so bad. According to Pew, over 80% of respondents rated their current community as excellent, very good, or good. The survey also reports that "ideal community type" was not dominated by any one class of place, with 30% preferring small towns, 25% suburbs, 23% cities, and 21% rural areas. Thanks to Steve Bartin for pointing out this hilarious bailout video, which then led me to The Daily Bail, a new site looking at the lighter side of the financial crisis. Stockbroker thuglife? Good stuff. Sunday’s Super Bowl game between the mighty Steelers and the upstart Arizona Cardinals – teams representing regions going in exactly opposite socioeconomic directions since 1950 – has eclipsed all non-sports news coming from Pittsburgh. Pro football, which Pittsburgh continues to excel at despite 60 years of economic decline, brutal population loss and criminally inept public sector mismanagement, is a seasonal religion every fall no matter how well the Steelers do. But when the Steelers make it to the Super Bowl, as they did this year for an NFL record seventh time, the region and its 2.3 million people are paralyzed by a religious fervor that can be culturally embarrassing. “Go Stillers” signs appear everywhere. Secretaries, retail clerks and TV news anchors wear black-and-gold Steelers garb on game Fridays and during the playoffs. If Ben Roethlisberger game jerseys had collars, an embarrassing number of professional men would wear them under their suits. The Pittsburgh public schools have instituted a two-hour delay Monday morning in an effort to thwart what should be a severe epidemic of the usual morning-after-Steeler-Sunday-night game flu among teachers. Eat n’ Park, a venerable and highly profitable family restaurant chain that ordinarily wouldn’t close if a meteor struck downtown Pittsburgh, has won enormous goodwill because it’s decided to close at 3 p.m. on Sunday so its several thousand employees can not only watch the Super Bowl but have several hours to prepare the sacred sandwiches and dips and dress up for it. If the Steelers lose, the whole town will be on a suicide watch till March. Even the Steelers’ success on and off the field could not defend Pittsburgh from the recession forever, however. For the last two months national publications that should have known better (like the Times) came to Pittsburgh, looked around at its service sector-university-government economy, and declared that it was some sort of model for other city-regions because it was apparently recession proof. Of course, reality turned out to be not so kind. Pittsburgh’s unemployment rate and stable housing prices were relatively better than the national figures only because its deindustrialized economy was already so stagnant that it never experienced fast job growth or a recent real estate boom and therefore couldn’t go bust. The latest regional numbers, as reported by PittsburghToday.org, a useful web site devoted to documenting the economic reality of the Pittsburgh region as well as boosting it, showed job losses accelerating in December for the second straight month. Compared to December of 2007, Pittsburgh had 7,500 fewer jobs in December 2008. November’s revised numbers, according to PittsburghToday’s Harold Miller, showed a net loss of 1,600. These numbers, while negative, are minuscule in a region with over 1.1 million jobs. In December jobs were up slightly year-over-year in health care, higher education, professional and business services, mining and construction, Miller reported, but about 10,000 lost jobs in leisure and hospitality, retail and manufacturing offset those gains. Miller, per usual for a professional civic booster, looked for and found a few relative silver linings in Pittsburgh’s permanently gray clouds: The job loss – 0.6 percent in December – was small compared to Detroit, which has lost 5 percent of its jobs in the last year. And compared to Cleveland – Pittsburgh’s rival in all things, including pro football, population loss and the rate of post-industrial economic decline – the former Steel City did better. The capital of Steeler Nation lost only 1 manufacturing job in 2008 for every 5 lost by the Cleveland, a city whose hapless Browns finished 4-12. But even if the Steelers – who are narrow favorites – whip the Cardinals Sunday and win their sixth Super Bowl in seven tries, it won’t do much to protect Pittsburgh from eventually being hurt harder by the national recession/depression. All this has happened despite a much lower number of cops per capita - and a much larger area to patrol - than New York. Police Chief Bill Bratton deserves a huge amount of the credit for this amazing transformation, but the department has also remade itself in the image of the diverse city it serves. Over a decade ago, the LAPD was 80% white. Today that number is 38%, with 41% of the force composed of Latino officers, 12% black, 7% Asian. Almost 20% of officers are women. The LAPD has put a lot of effort into fixing its poor image in the communities where it was most detested - admitting to its checkered past in minority communities. And its strategies are working. 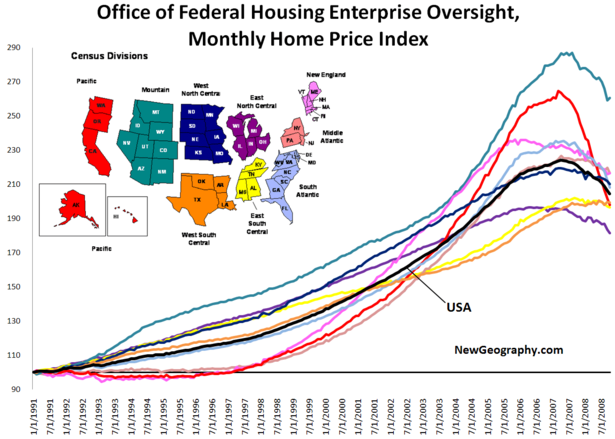 Here's a look at the monthly Office of Federal Housing Enterprise Oversight monthly housing price index by US Census Region. The OFHEO index gives us a little different geographic cut than the popular S&P Case-Shiller Housing Index. We can see the extreme fluctuations in the western US, especially in the Pacific states. These are seasonally adjusted numbers current as of October 2008. The black line, depicting the national composite, finishes at 204 - indicating a doubling of housing prices since 1991, but a fall of 8.8% since its peak in April 2007. The 8.8% national decline is interesting considering the larger declines depicted by the metropolitan focused Case-shiller index. Judging by these numbers, the housing prices in the 8 states of the West South Central and East South Central Regions appear to be most stable. 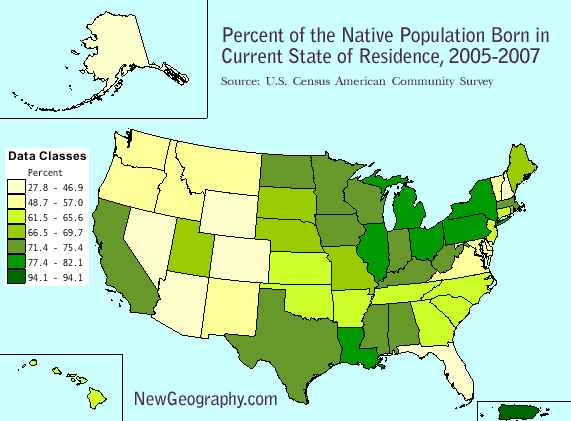 The Great Plains states fare remarkably well, and the east coast states are falling in line with the national average. Interestingly, end-to-end growth in the Pacific region ends up about the same as the stable south, yet it took a much more turbulent path to reach that point. According to OFHEO, the data "is obtained by reviewing repeat mortgage transactions on single-family properties whose mortgages have been purchased or securitized by Fannie Mae or Freddie Mac since January 1975." Here's more on the OFHEO housing price index methodology. Recently, I saw Clint Eastwood’s extraordinary new film, 'Gran Torino' in Hollywood. Set in a declining Detroit neighborhood, the movie chronicles the unlikely relationship retired auto worker Walt Kowalski (Eastwood) forges with his new Hmong neighbors. Walt is cranky, surly, and bigoted while still possessing a certain rough-edged charm. His dialogue is laced with racist terms and stereotypes that would mandate a lengthy “sensitivity training” seminar if he came of age in a different era. And yet, the audience laughed and laughed loud. Here, in one of the nation’s most multi-ethnic cities with a history of racial tension, blacks, whites, Asians and Latinos were chuckling as Walt bemoaned “gook food” and cringed at his neighbor’s ways. Twenty years ago, Walt’s language would have appeared less ironic, perhaps being interpreted as a sign of how a sizeable percentage of white Americans viewed minorities. To laugh at Walt then would appear to be laughing with him rather than at him. But in 2009 America, on the cusp of a black president arriving in the White House, a character like Walt feels safely anachronistic – his views seem fringe like. What seemed funny to the audience is that people like Walt still exist. What is so satisfying about 'Gran Torino' is how it eschews political correctness and decides to speak to an audience that it figures will laugh at Walt rather than with him. It assumes that Americans watching the film are smart and tolerant enough to get the joke. And they do. I’d be curious to know how audiences reacted to the movie across the country.